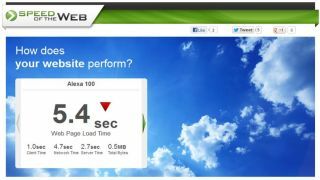 Technology performance service Compuware Corporation has launched a new service Speedoftheweb.org, to help web owners to compare and optimise their web sites. A sites performance is one of the few knows about the way Google ranks websites on their search results page; the slower the response time, the lower down the search results a site appears. Unfortunately for most small businesses testing your sites latency (the time it takes to respond to a customer typing in the URL and hitting return) and comparing it against the competition is a costly business, which is where Speedoftheweb comes in. All a business needs to do is put in their businesses web address in to the Speedoftheweb site, then choose a site for the test to come from - there are six sites spread around the world to choose from - and hit return. Compuware then calculates the web performance – it takes about 45 minutes for the test to be completed - and compares it to one of 15 lists of 1,000's of the world's most trafficked websites—as ranked by Alexa and Compuware Gomez benchmarks – in different vertical sectors including: finance, healthcare, travel, retail, media, sports and more. In addition the site also offers 15 key performance indicators (web performance optimization KPIs) using Compuware dynaTrace and PurePath Technology, in-line expert recommendations and immediate action paths to easily improve web performance. "With end-user expectations higher than ever, the cost of poor website performance is huge, both in terms of lost revenues and brand loyalty. End-users are showing less patience for slow-performing websites and expect their applications to perform at lightning speed. Even a slight reduction in application performance can determine if a customer will return to a website to do business again," said Alois Reitbauer, Center of Excellence Web 2.0 & Mobile Performance Expert, Compuware APM.